What was the commercial outcome of Flavors? FLAVORS had a long run and a slow but steady inflow of revenue. There were theatrical releases in North America and India, then home video sales, then television rights - HBO in Europe, Star network in Asia etc. We recovered the money we put in. The norm is that in your first film, you don't make much money. Like they say, your first film is your ticket price for entry into the industry. The film was a much bigger hit critically. Right now it has achieved a cult status among NRIs the world over. We still get mails from fans of the film, 4-5 years after its release! Why is there so much of gap (4-5 years) between Flavors and 99? FLAVORS was our first feature film. I guess it would have been easier to make another film in the same industry. But we wanted to make a mainstream Hindi film. So we were treated as new-comers again. FLAVORS did bring us a lot of mileage in terms of access to actors. Also we had to tie all the loose ends of our old lives and start new lives in Mumbai in the Hindi film industry. That took some time. Then casting and getting the actors' dates took some time. Fortunately for us, our producing partner from FLAVORS, Anupam Mittal, was all set to start his own production company here in India, so getting the production off the ground or finding the finances was not too much of a challenge. In the meantime we did make a short film called Shor (Noise). The film has been received very well in many prestigious film festivals and won the Best Film award at the IAAC film festival in New York. We also used this time to develop a few, including a couple of Telugu scripts. We had plans of making a fun Telugu film. We do have a Telugu film in production right now called Inkosaari, being directed by a good friend. All this time though, helped make 99 a tighter, better script. For any film, the script is king. 99 went through almost 10 drafts until it was just perfect, before we went into production. What is 99 all about? 99 is a crime-comedy-thriller-historical-fiction. It's a genre-bender of sorts. It is what we call a "smart comedy." The film is set in the year 1999. A historical controversy that broke out in the year forms the backdrop of the film. It is done in a light-hearted manner and blends fact and fiction. What happened is fact and how it happened is what we show in the film - and that's all fiction. It's a fictitious story based on real incidents in 1999. At the end of the film the viewer may not be able to tell what part was fact and what part fiction. It is a completely original film. Our goal was to provide a fresh, new kind of humor to the audience. We took a lot of care in the structure and execution of each scene. We believe it is a one-of-a-kind comedy and the audience will have a fun time watching it. Tell us about how the cast performed. How did you get a fat boy look to Cyrus Broacha? The film has a unique and eclectic cast. The casting is the way it is because the script required it. All the actors were cast because they fit the role to a T and each one believed in the role he or she was essaying. We didn't necessarily have this exact cast in mind when we wrote the film, but now that the film is made, I can't think of anyone else who would have fit any role better. Cyrus plays a fat guy in the film. It was a combination of techniques. We made him put on weight for the role. He gained almost 10 kgs. We used prosthetics for his mid-section, we also set camera angles sometimes to enhance his size, we designed clothes for him that made him look fat... It is a combination of techniques. Cyrus for his part imitated a fat guy to the core, in terms of how he walked and moved around. Not many Telugu directors made in big in Bollywood except for Ram Gopal Varma. What is your take on it? Is there any south Indian prejudice in film industry? There isn't any South Indian prejudice in the industry. It is a question of adapting to a slightly different kind of filmmaking style, story-lines and a different audience. Ram Gopal Varma has been immensely successful in doing that. Murugadoss has made the biggest hit ever in Hindi (Ghajini). Rehman has been routinely scoring great music for Hindi films. So there is no bias that is apparent. There is a multiplex strike going on. Are you guys having any problem in releasing 99 in multiplexes? We have tried to stay clear of all controversies. But this one seemed to find us. We had always planned to release the film during a major cricket event (in this case IPL) because the film has a strong cricket connection. We were ready to release the film on May 8, but since the strike is on we moved the release by a week to May 15. Being new-comers in the industry we have to respect the intentions of the veteran producers and at the same time still release our film at the most suitable time for us. Being Telugu guys, you started with English project and now came to Bollywood. When can we expect a Telugu film from you guys? Very soon. We've always wanted to make a Telugu film. We came very close to making one last year, but it didn't quite work out. After 99, we have 3 scripts ready, one a mainstream Hindi film, one an international film set in Mumbai, and one a fun Telugu film. How is it possible for two guys to direct a film together? Don¹t you have any disagreements? Two heads are better than one. As long as the heads are thinking in the same direction and are on the same wavelength. Once an idea is conceived, we develop it together, through the script stages over the few months it takes to finish the script. We discuss and decide on the overall flow and story, then split up the scenes between the three of us (including our writing partner, Sita Menon). Each one reviews the scenes of the other two and by the time we're done, we're all on the same page and it is forgotten who wrote the first draft of the scene. Having lived with the script for so long, we both are on the same page by the time it comes into production - in terms of the visualization of the scenes and the feel of the overall film in itself. This leaves little room for disagreement on the sets. Not to say we agree on all things 100%, certainly there are ideas that are contentious, and on these, we pow-wow and reach an agreement way before we go onto the sets. What is your marital status? If married, don¹t your spouses complain about two guys doing things together? Both of us are unmarried. So thankfully there's no one to complain. Tell us about the story of Inkosari that is penned by you? Inkosaari is the Telugu film we have in production right now, in association with Bay Movies. Originally we had intended to direct it ourselves, but we got busy with making 99. Now the film is being directed by our friend Suman Pathuri, who assisted us during FLAVORS. The film stars Raja, Manjaree, Richa, Vennela Kishore, Ravi Varma amongst others. The music is composed by the very talented Mahesh Shankar. He is also a very dear friend right from FLAVORS days. Incidentally he also scored a fun song for 99. In one word Inkosaari can be described by "nostalgia." The script of Inkosaari is very dear to us. Most of the characters and incidents in the film are fictionalized versions of us and our friends and incidents from our lives. It is the story of a group of friends from college, who, some years after they all separate, meet up for a few days, away from their families and responsibilities and re-live the college days. They all decide to do one thing they had wanted to do then, but could not. A second chance. Inkosaari. I think every person will identify with this concept. How many of us have wondered what it would be like if we all got back together with our college group of friends and spend one week with them, reminiscing about those days! After the week is over, you go back to your lives and jobs. 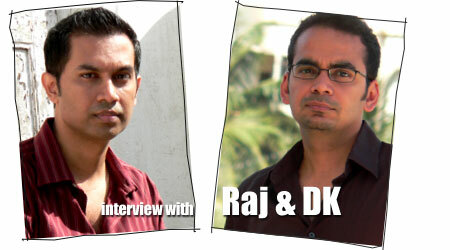 click here for another interview of Raj & DK taken during the time of Flavors.